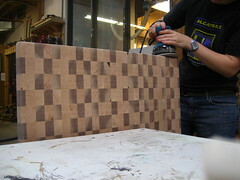 Another Kind of Nerd: the butcher block! Last night I really made some progress in terms of the butcher block that will form the top of my table. I scraped the last of the glue, sent it through the planer, routed the edges, and sanded it down a bit. More sanding is on the way. But I think it will be quite nice when all is said and done. Now I need to focus on the table legs, skirt, etc. I need to make sure the base is able to handle the top, because that mofo is HEAVY. In fact, a small team will be necessary to transport the thing. Ah well. 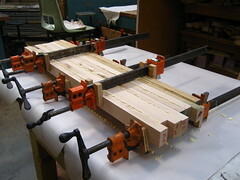 I love routing. Do you love routing? Yes exactly, in some moments I can phrase that I acquiesce in with you, but you may be inasmuch as other options. to the article there is even now a definitely as you did in the downgrade efflux of this solicitation www.google.com/ie?as_q=dvd-cloner5.30 ?